We install synthetic golf greens and lawns throughout the greater Raleigh-Durham area, including Cary, Morrisville, Apex, Holly Springs, Wake Forest, Rolesville, Chapel Hill, Carrboro, Knightdale, Creedmore, and the entire Research Triangle area. 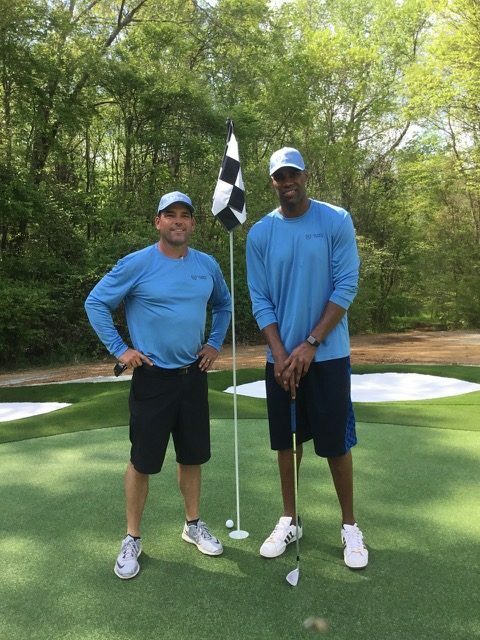 Former Tarheel and NBA Pro Antawn Jamison with Celebrity Greens Co-founder Weston Weber, standing on his own private Celebrity Green! Free Consultation & Design Estimates. Call 704-533-3502. Former Tarheel and NBA Pro Antawn Jamison’s Celebrity Green! Welcome to Celebrity Greens Raleigh-Durham in North Carolina. We’re the Authorized Partner of Celebrity Greens for the area, and we specialize in putting greens and synthetic turf landscaping. 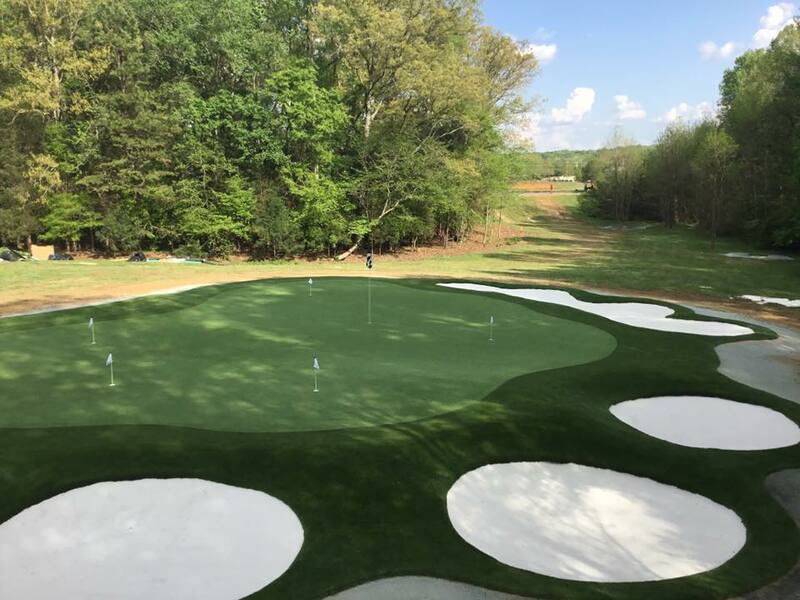 If you’re looking for gorgeous, custom, artificial grass Golf Putting Greens, Lawns, Dog Runs, Playgrounds and Play Areas, Sports Fields, or Pet Turf you’ve come to the right place. Our American-made turf is top quality, will withstand heavy usage and extremes in weather. Even better, our installations require very little maintenance or upkeep. Our products come with a limited 8-year warranty, but the actual life expectancy is much longer, depending on use. When we design a custom artificial grass putting green or synthetic grass landscaping, we use American made turf products which are environmentally friendly and safe for kids and pets. Our Grass Lawns and Golf Greens are easy to maintain. They require no mowing or watering, they’re long-lasting and look beautiful year round. Celebrity Greens has installed thousands of golf greens and artificial grass landscaping projects in both residential and commercial properties, and we have the training and expertise needed for a long-lasting, beautiful project. Our US-manufactured turf is backed by an 8-year manufacturer’s warranty and is the most realistic and durable turf you’ll find anywhere. Don’t be fooled by cheap Asian products. Our turf will hold up for years and look fantastic doing it. And our installation team is second to none. 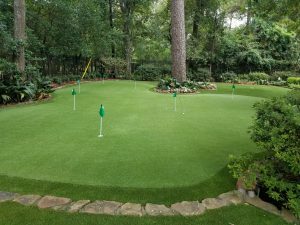 We specialize in unique, professional grade putting greens, designed to make the most of your backyard or commercial space. 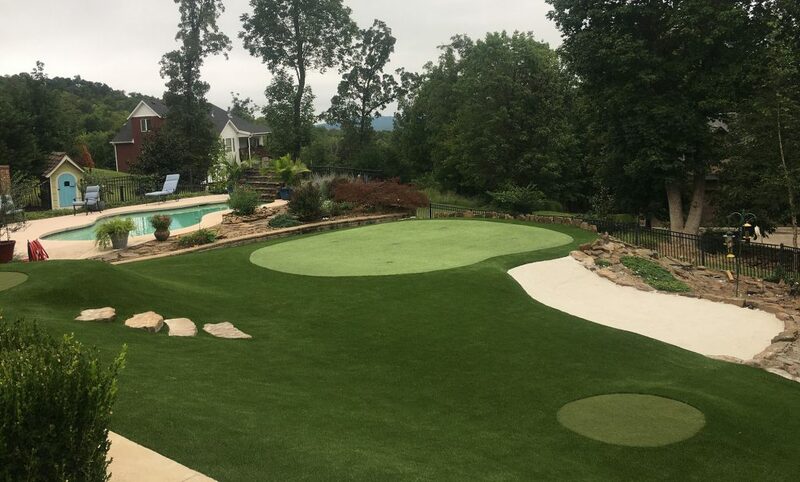 Contact us today at 704-533-3502 for a free consultation and let us work with you to design your dream golf green or replace your existing lawn with an Artificial Grass Lawn. If you are interested in a Playground, Play Area, Dog Run or Sports surface, we can do that too!